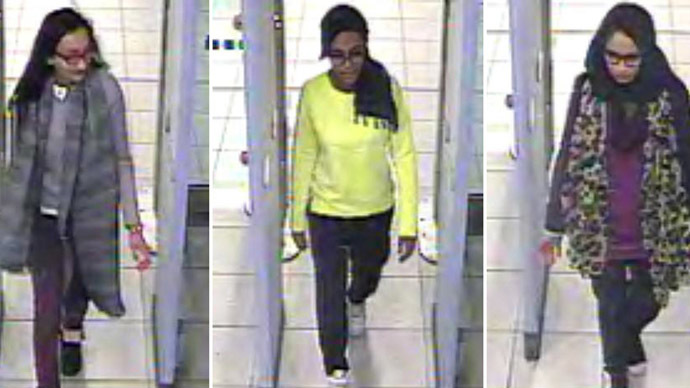 The three British schoolgirls who are believed to be trying to join up with Islamic State have been caught on CCTV at a bus station in Turkey. The video showed them in Istanbul, before they boarded a bus to travel to the Syrian border. The footage shows them at the Bayrampasa bus station, which is on the European side of Istanbul. They reached the terminal by using the city’s metro system after arriving at the airport, the Turkish newspaper Milliyet said. The pictures were dated February 17 and February 18. The three schoolgirls, Amira Abase, 15, Shamima Begum, 15, and Kadiza Sultana, 16, waited at the bus station for 18 hours before they eventually got on a bus to take them to Sanlifurfa, 50 kilometers away from the Syrian border. British police believe they have since entered Syria, using a particular crossing controlled by Islamic State militants. “Officers ... leading the investigation into the three missing schoolgirls from east London, now have reason to believe that they are no longer in Turkey and have crossed into Syria,” British police said in a statement. Britain and Turkey have been blaming each other for not being able to track down the schoolgirls. Ankara said it took three days for the UK to inform them that they had gone missing. “It is a condemnable act for Britain to let three girls ... come to Istanbul and then let us know three days later ... They haven't taken the necessary measures,” Turkish Deputy Prime Minister, Bulent Arinc said. British security services are also being scolded for not doing more to prevent the three girls leaving in the first place after clues appeared on Twitter. The police and intelligence agencies failed to notice a public message Shamima sent on Twitter to Aqsa Mahmood, a 20-year old from Glasgow who fled to join the IS militant group in 2013. Mahmood, who traveled to Syria to become a “jihadi bride” in November 2013, has over 1,500 followers on Twitter and has used the platform to encourage “sisters” to join her. It is also alleged she has advocated terror attacks through Twitter. The decision by the three teenagers, who were all friends at the same school in East London, to try and join up with the ISIS jihadists is part of a worrying trend in the UK. It is believed 60 women, including 18 teenagers, have already departed from Britain to travel to Syria and become part of Islamic State. “This is a growing problem and it’s one of real concern. The more everybody involved in travel can be alert and be vigilant and look out for people the better,” Deputy Assistant Commissioner Helen Ball, the senior national coordinator for counter-terrorism, told the BBC. She added that potential militants are becoming wiser to police surveillance methods and that it is becoming harder to stop people from trying to join up with the terrorist group, also known as ISIS, or ISIL. “But mostly this is about vigilance of everyone who is working in the industry … some of those women and girls are very carefully prepared for their travel so that they don’t stand out. They take unusual routes and it is very hard to spot them,” Ball said. The Islamic State is keen to attract young women to join its ranks, with the organization believing they will become brides for their fighters. The militant group had even posted a 50 page e-book titled Hijrah to the Islamic State, to help advise people on how to get to Syria. UK police have been trying to get the travel guide removed from the internet. In December, the group published a gruesome guidebook for its fighters on how to buy, sell and abuse captured girls – even if they have not reached puberty. The manual, in Arabic, titled “Questions and Answers on Taking Captives and Slaves,” was circulated on Twitter.